Emirates Business and First class lounges are justly famous: both for the ornate gold decoration, and for the way they really try hard to pack customers in. This is less of a problem that it once was, now that Silver cardholders are restricted to a very poor lounge in Dubai, and Gold Skywards members can no longer bring in a guest. One good thing about The Emirates Lounge is that they are very consistent: every lounge has not only identical facilities, but even the food is the same. This is great in one way: even half way around the world you can be sure of Verve-Cliquot Sparkling Wine, a prawn salad, and big squashy leather armchairs. This can also be a bad thing: the beer, wine, and decor do not reflect the location where you are. You pays your money, and takes your choice, although the choice here is pretty good. 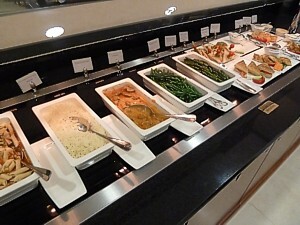 The lounges are generally pretty much top-notch in terms of food, with a very good spread laid on for pre-flight dining. At the Dubai hub there are separate lounges for First, Business Class, and for Skywards top tier members who are on economy tickets. 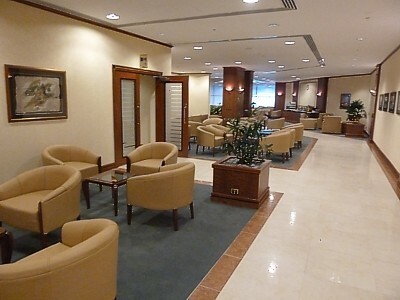 Other than that at most outstations, there is only a combined First and Business Class lounge. You get access to the Emirates Lounge with a Business or First Class ticket, and in this class you can invite one guest who is departing on the same Emirates flight in economy. Otherwise, you also get access with a Gold Skywards card, but you can no longer bring in a guest. There is no way to buy access - unless you buy a Business or First Class ticket of course! Emirates don't like using contract lounges: the airline believe that this debases the product, and as a result there are mainline lounges in many outstations, and the airline is trying hard to install lounges at as many of its locations as it can. 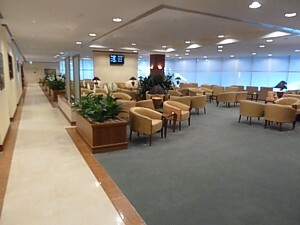 Emirates lounge locations are at the Dubai hub, plus outstations including Auckland, Bangkok, Beijing, Birmingham, Brisbane, Frankfurt, Hamburg, Hong Kong, Mumbai, Munich, Johannesburg, New York JFK, Kuala Lumpur, London Gatwick, London Heathrow, Paris CDG, Singapore, Düsseldorf, Manchester, Melbourne, Perth, Sydney, and Zürich. 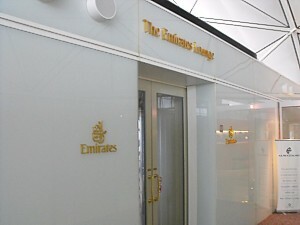 NEWS: The Emirates Arrivals lounge in Dubai has closed. 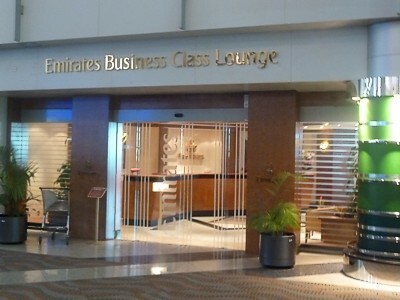 There are full lounges facilities at Emirates hub in Dubai, with the lounges currently split between First Class, Business Class, and a separate Emirates Lounge Dubai for those passengers in economy with status. Alas the old arrivals lounge in Terminal 3 has now closed, as few passengers used it, instead getting straight into the free car offered to First and Business class passengers. Access for First Class passengers only. 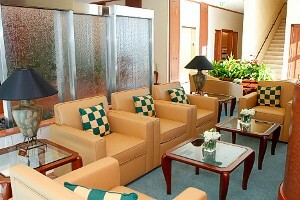 This is a large open lounge with high wide windows, lots of plants, and even a twinkling fountain. It is open 24 hours a day, and is exceptionally well patronised, even at night. Oddly, it doesn't seem too much of a step up from the Business Class lounge. However there are three seating areas inspired by a unique theme - Arabian, Mughal and Asian, believe it or not. Food is just as you'd expect, with waiters on hand even in the middle of the night in the à la carte dining area. The buffet in the First Class dining area is less formal, and has sandwiches, Sushi, and even Asian specialies such as Peking-Duck. 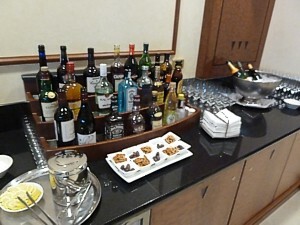 The bar is equally good, with fine selection of alcohol, including Sparkling Wine. If you fancy raising a glass, there is even a vintage Wine Cellar where you can taste and purchase exclusive (make that expensive) labels. There are wine connoisseurs available for a chat. 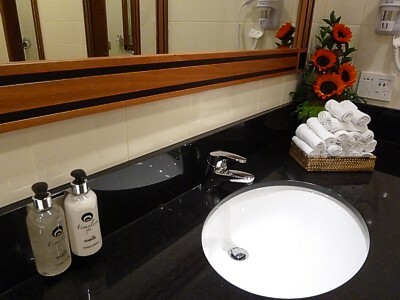 There are showers and a bookable spa, along with quiet rooms that have an individual shower available. In the corner is a business area with several computers, and free wifi. There are a couple of TV viewing areas showing BBC World channels on large 32 inch plasma screens. Access for First & Business class passengers. 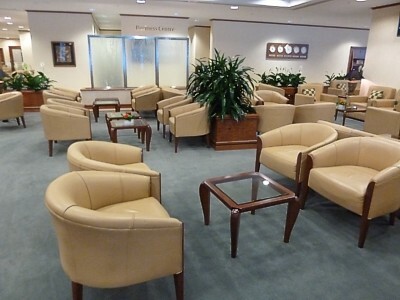 This superb lounge gets absolutely packed at peak times, particularly with the stop over flights changing between Australia and the UK on the kangaroo run around midnight, and again at 7am in the morning. No wonder then, that passengers in economy with status are packed off to the lesser lounge at G9. It really is a mark of the huge number of business class passengers Emirates attracts that in here are more than 400 leather seats, each one of which will be full before the 2am departures. It does look lovely though, with water features including, yes, fountains. Set over two levels there are full height panoramic windows overlooking the apron, and themed areas around the concepts of Fire, Water, Air and Earth. I kid you not, the Emirates designers really believed in this stuff. Alas, they forgot to make the lounge big enough. 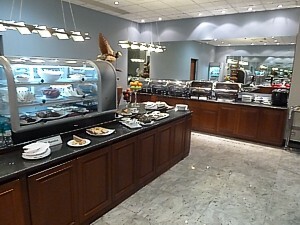 Food is good, with a decent walk up buffet counter including sandwiches, fruit, cakes, soups, baked potatoes, and sushi. 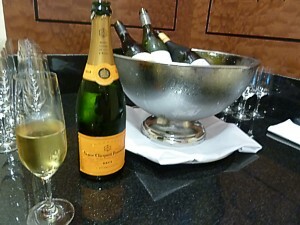 Bar facilities are equally good, with lots of alcoholic drinks, including Verve-Cliquot Sparkling Wine. There is always a huge queue for the Showers which are located inside the lounge, however it's hard to get access, and they are always crowded and not always well cleaned. However the Molten Brown soaps are a nice touch. The Spa (called "Timeless") in the lounge offers beauty and massage therapies as well as hairstyling. There is a small business area, however these facilities are often cluttered up with other peoples children playing computer games, and the internet is a bit patchy. Thankfully there is free wifi. International newspapers and magazines are supposedly available, but these are mostly American: it is hard to find an English newspaper. Thankfully there are some 42-inch plasma TV screens. There is much advertising about it, however the four guest bedrooms where you can sleep if you have long connections are almost always booked up a long time in advance (although it is technically it is first come, first served). Access for First & Business passengers AND Skywards Gold & Silver members plus one guest. 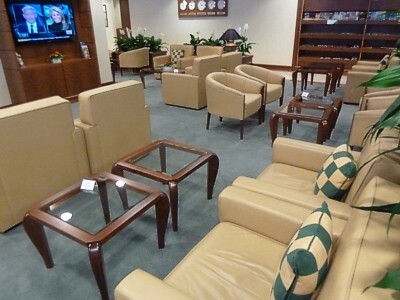 This is the older lounge which Skywards gold and silver members are shuffled off to. It's not too shabby, with two bars, and panoramic windows overlooking some of the gates. There is complimentary food 24 hours a day, and Sparkling Wine is available here too, although noticeably supplies in this lounge are always permitted to run down a little, giving passengers the impression they should really have bought a business class ticket, rather than simply gaining entrance with status. Access for First & Business passengers and Skywards Gold members. The Emirates Lounge in Sydney is stuck in the basement, but you'll have a long walk to get to it, now that Sydney Airport have closed the closest entrance and make you walk through the lefthand duty free maze, via the shopping hub, down a long corridor, and then through the second older duty free hub. A maze, it is indeed. Finally you get to it, one floor beneath the main departures level and two floors below the Singapore Airlines and Air New Zealand lounges. Access is via the slow lift that foes to the lounge above, and past the Malaysian Airlines lounge. 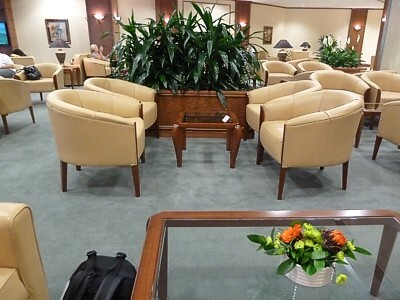 Here's a factoid for you – this lounge used to be the United Airlines lounge, until major cutbacks (and the fact it was lousy) made them use the AirNZ lounge. Now it is all Emirates. The lounge is big – and it needs to be – because there are three flights to Dubai – one via Bangkok – plus a daily flight to Auckland, and another one to Christchurch. Thankfully, these are staggered throughout the day, but even so, with five daily flights, three using an A380, this lounge can get packed, particularly late at night when all those on the A380 from Auckland pop in, and join those on the A380 to Sydney. The lounge is exactly what you would expect from other Emirates lounges – exactly the same decor with lots of wood, beige leather armchairs, and lots of small coffee tables. At least there are windows, although the view tends to be of aircraft noses, because the lounge is low down. There are plenty of armchairs, or as you go around there is the dining area, and the usual long worktop with a view out of the windows. Food is great, with a decent breakfast available for the horrendously early 6am flight to Dubai, and the later 9am and 10am flights to Auckland and Christchurch. You can get a decent cooked breakfast, with eggs either scrambled or baked en cocotte, plus hash browns and mushroom frittata. Alas no bacon, and the sausages are... chicken. Halal it definitely is. There are also European-style deli plates. Later in the day for the evening 7pm Bangkok flight there are the usual hot selections including curry and pasta, plus beef and ham salads, prawns, salmon, and a great range of deserts: these are refreshed for the 10pm Dubai flight. 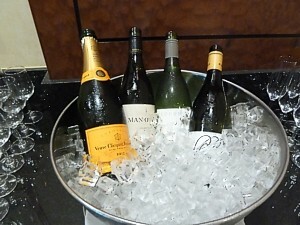 The bar is the usual Emirates selection, with three whites (with generally Cloudy Bay Marlborough Sauvignon Blanc, along with a Chardonnay, and Pinot Gris) plus three reds. Absolute top marks must go for the bottles of Sparkling Wine, no Aussie sparklers here, it is the proper French stuff : Verve-Cliquot no less, and better than the Moet served on the plane. However in the mornings it isn't chilled, unless you open a bottle from the fridge yourself. There is an equally good range of spirits. Computers are fairly good, with four desktop PCs with a lightning fast internet connection, and a printer. The Wifi is pretty good too, although here the wifi password (emiratessyd) isn't displayed on the tables, it is on a card handed out at reception. There is a magazine rack with all of the Aussie papers, and a vast range of magazines, although all of them are the Dubai edition. There are also showers, and in the far corner two massage chairs. The brand new Auckland Emirates Lounge is a huge change from the older lounge (opened in 2003 and closed in 2011 due to massive overcrowding). It now has windows for a start, plus a much larger dining room, many more seats, a bigger business centre, and more showers. Indeed, you may wonder why Emirates needs such a vast lounge in Auckland, which is after all, the end of a long line from Dubai. There are however three planes (and two of them massive A380s) all due to depart Auckland to Dubai within 35 minutes, it needs it. This place can get packed. These three planes split to Melbourne, Sydney and Brisbane, before joining up again the next morning in the UAE. Most London bound passengers are on the 1850 via Melbourne, and hang around the lounge the longest, however if you want to maximise lounge time, the A380 to Sydney may be a better bet, as this generally goes to the A380 gate, gate 16 (under the lounge and turn right). The lounge itself is easy to find: turn right after security and the duty free maze, along the small corridor to the right, turns sharp right at the new Emperor lounge, up the escalator, and turn right at the Qantas lounge. There is a large reception desk – often with two receptionists from when the lounge opens, right on 2.30pm, as soon as early check in kicks off. Check out the statue at reception too: this monumental animal bronze is as pricey as the lounge – it cost no less than $2million. It sets the tone for the lounge, which is full of what is unsubtly known as Dubai Chic: The lounge is full of gold, tan leather, fountains, expensive artwork on the wall, and with opulence screaming louder than elegance. Welcome to Dubai. 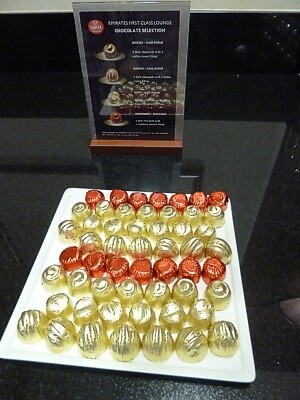 There is no separate Emirates First lounge in Auckland: both First and Business are lumped in together, but at the back of the dining room is a small counter for First, with better Sparkling Wine glasses and First chocolates. The new Emirates lounge Auckland is shaped like a great big U, with the toilet block in the centre: you enter up one arm of it, where there are a couple of large seating areas. At the bottom of the U are the large floor to ceiling windows. Alas, the view isn't great: it's of the duty free shop, and large curtains hang down obscuring sight of aircraft, which are behind another viewing platform anyway. There is a fountain here (more of a water feature really) in front of the entrance to the business centre, and vast acres of seats, plus a couple of large plasma TVs, which are always on CNN, however you can reach around the side to change the channel to the domestic NZ channels. Further around, up the other end of the U, is the dining room, with a long low counter overlooking the windows, plus plenty of dining chairs, all neatly decked out and even with flowers on the tables, and then at the back of the table area is the rectory side board, with food and drinks. 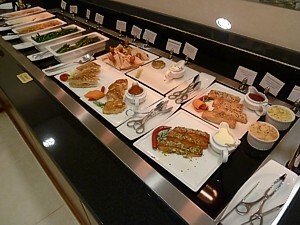 And it is the Food which is the mainstay of this lounge. Many people eat as if they haven't seen food in weeks. It is laid out on a sideboard opposite the main dining chairs. Alas getting hold of one of these chairs can be a little tricky at peak times. Reflecting its status both as a combined First and Business lounge, and also as a lounge 'at the end of the line', where most passengers are in for a very long haul, food is a little better than you might expect. Under the hot plates there are hot dishes with lamb curry, chicken tagine, pasta, noodles, and fish, along with a heated tray with hot sandwiches, Zucchini Pates, salmon steaks, sausage rolls (chicken sausage of course) and meat pies. There is a large pot of soup (changes daily). Garlic bread is in the basket. Next to it in the standard Emirates round fridge with lots of mini plates laid out with different types of salad: there are lables on them all showing what they are. There are also plenty of desserts in mini-bowls, or cheesecake slices on a plate. Of course the main attraction is always the bar. There are two bar areas, both by the dining hall, and by the first TV as you walk in. It is fully stocked with some excellent Kiwi wines, including three whites (with generally Cloudy Bay Marlborough Sauvignon Blanc, along with a Chardonnay, and Pinot Gris) plus three reds which are oddly among the spirits on the bar top. Absolute top marks must go for the bottles of Verve-Cliquot Sparkling Wine: no kiwi sparklers here, it is the proper French stuff. There are better glasses if you go to the rear of the dining section which is designed for First passengers, but made available of course if you are in business, or even slumming it in economy and just using a Gold card. Spirits are equally good, with the usual Emirates selection of Martini (3 types) Campari, Canadian Club, Baileys, Drambuie, Kahulua, Cointreau, Absolute, Bombay Saphire, Bacardi, Mount Gay rum, Glenlivvett, Hennessy VSOP, Chevas Regal, and Jack Daniels. Beer is in the fridge, with Stella, Amstel, Crown, Heiniken, and Steinlager. Soft drinks are however very poor, with just Coke (normal and diet) and Sprite). Computers are fairly good, with eight brand new desktop PCs with a lightning fast internet connection in the new Business section. The Wifi is pretty nifty too: the password is on cards on the tables (p/w: emiratesakl). 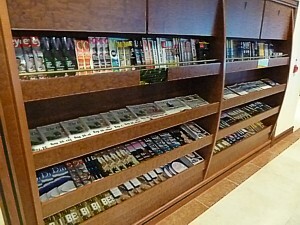 The huge magazine rack in the Emirates Auckland Lounge is also worthy of note: despite the distance, you can get copies of all the Dubai magazines, from Golf to Time Out (and they are updated weekly too). There are also all the usual Australia and New Zealand papers. 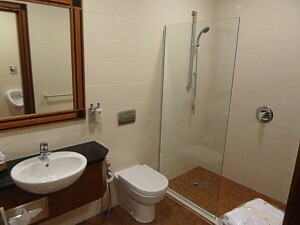 The bathrooms are noteworthy, with most excellent showers (two each in the gents and ladies). Bath robes and towels are left in the showers, along with shampoo. Soft rolled towels, hair dryers, and even small packets of toothbrushes and razors are left in the toilets too. Incidentally at Auckland there is always a frantic zoo at the gate, particularly with the A380 to Sydney (which generally leaves from gate 16: a fair hike from the lounge) and the 777 to Brisbane (which is sometime a bus-from-the-gate job). Hence the lounge has a decent boarding process of waiting until almost everyone has boarded, and then making two calls, so you can spend an extra 20 minutes drinking in the lounge. See more lounge images. Emirates have a full lounge in Singapore, both for direct flights to Dubai, and for the triangular route that pops into Colombo on the way. 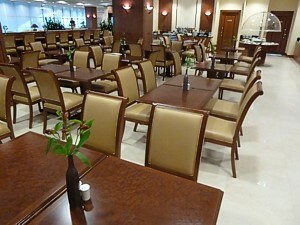 The lounge is pretty new, having received a revamp when Emirates increased operations here. The lounge itself is easy to find: is located almost right above the Skytrain station in terminal 1, opposite the French cafe, beside the electronics shop, but fairly dark. Adding to the feeling that you've entered the underworld is what is unsubtly known as Dubai Chic: The lounge is full of gold, and tan leather. Welcome to Dubai. The lounge is oblong, with a couple of main rooms, and windows overlooking a green bit of tropical shrubbery, divided between dining and relaxing. There are large wall hung TVs, which generally show CNN, and huge wooden pillars. Food is very good, laid out on a sideboard opposite the main dining chairs. Alas getting hold of one of these chairs can be a little tricky at peak times. Reflecting its status both as a combined First and Business lounge food is a little better than you might expect. In large tourines there are hot dishes with lamb tagine, pasta, noodles, and fish, along with a heated cupboard with sausage rolls (chicken sausage of course) and meat pies. Next to it in the fridge is a big bowl of salad, along with some desserts in mini-bowls. Of course the main attraction is always the bar which is fully stocked with some excellent Kiwi wines, including three whites (with generally Cloudy Bay Marlborough Sauvignon Blanc, along with a Chardonnay, and Pinot Gris) plus three reds. There are bottles of Moët Sparkling Wine in the fridge. Spirits however are rather bland. Beer is Heiniken and Tiger beer. There are two bar areas: both by the entrance as you come in, and in the dining area. Computers are fairly good, with four desktop PCs with a lightning fast internet connection. The Wifi is pretty good too. Power sockets are standard UK/Singapore. There are also showers, and in the far corner of the second room, a massage chair. This is a lovely airy lounge located just at the foot of the pier, where the two arms split off. It is on the top floor, and offers great views of the runway. 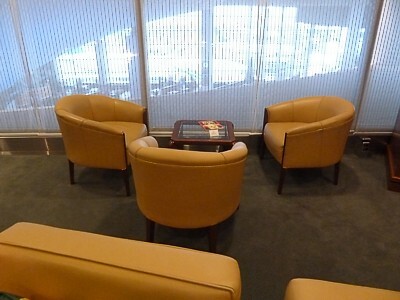 It's besides several other lounges: United on one side, and Thai on the other. 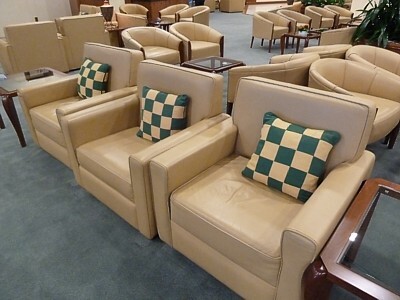 The Emirates Hong Kong lounge has the same furniture as most of the other Emirates lounges, including the slippery polished fake marble floor tiles, and tan leather armchairs. Here at least there are a few more formal sit up chairs, around the glass coffee tables. Food is oddly poorer than at most other Emirates lounges. True, there is the usual circular fridge, with salads on small plates, but there are only a few of these and you need to be quick to get them. Other than that there is the usual sideboard with tubs of rice, pasta, curry, fish and chicken. The bar is equally OK, but not the best. There are two bottles of red and white, and a rack of 20 or so spirits. Carsberg beer is in the fridge below. Unusually in this lounge there are lounge attendants who walk the floor offer to get drinks for you, but this takes so long it's easier to get them yourself. NEWS: The new Emirates Arrivals lounge at London Heathrow Terminal 3 has opened. The Emirates lounge in LHR Terminal 3 has been open since 2006, and as such it is starting look a bit tired now, but it is still full of the Dubai Bling, as full as it ever was before Dubai fell on hard times. 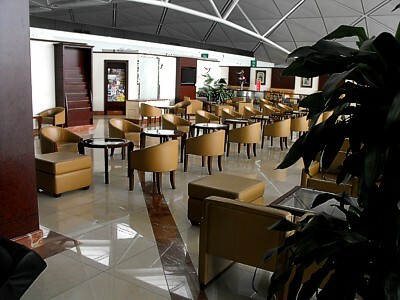 It is located in the main lounge area, past duty free and on the way to the gates. The entrance looks pretty anonymous, but once you climb the stairs there are panoramic views with floor-to-ceiling windows overlooking the airport's southern runway. 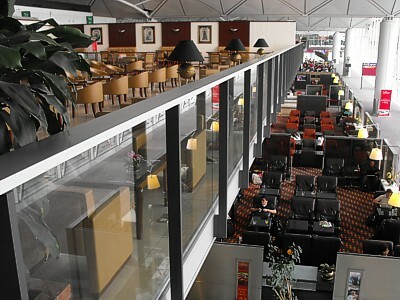 The lounge itself is long and thin, but with the thin bit overlooking the runway, that's not a bad thing. When first built it was large – very large – with seats for 190 passengers, but with so many flight to Dubai now using the A380, it can get pretty cramp. There are the usual tan leather armchairs available, and flickering plasma screens, which are generally on BBC News 24. Food is good, with a sideboard with hot dishes. These aren't always very appetising, and generally involve lamb or chicken. Avoid the sausage rolls, which are just chicken. A novel part of the lounge is that in the fridge salads are laid out in small bowls (the salmon is particularly good), so you pick the bowl as a whole. In the same fridge there are Muller rice, and other rather odd deserts. You can also choose from a menu, and here the hot offerings are large, with everything from Shepherd's pie to Veal Schnitzel. The bar is free flowing, with beer in the fridge, two types of red and white, and proper decent Sparkling Wine - it's that Verve again. 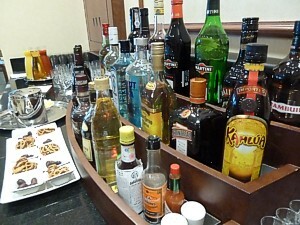 Alas at the Emirates lounge London Heathrow the spirits though look like an afterthought. On three wooden tiers on a corner of the sideboard are 15 or so bottles, include Bombay Sapphire, Malibu, Tia Maria, Baileys, Bacardi, and Contreau. A business centre has 10 PCs, which are now very old and tired. There are also four laptop stations, where you can plug into the LAN, which is equally a bit slow. There is also Wifi. There are showers at the back of the lounge. 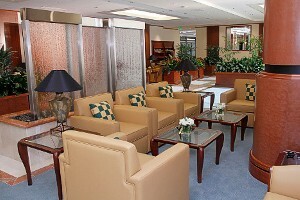 At Heathrow, boarding for Business and First Class passengers takes place directly from the lounge. This allows you to fully isolate yourself from the hassle that is Heathrow's busy Terminal 3. If only Qantas would take note. 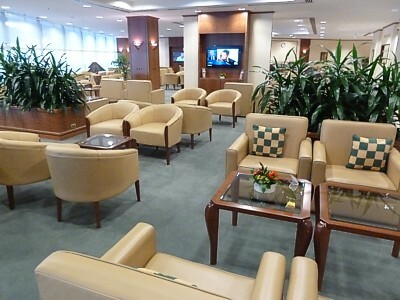 There is now a new arrivals lounge at London Heathrow. 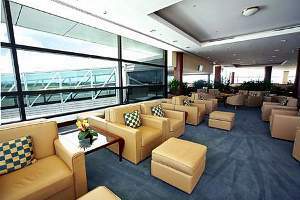 If you are in Business or first class, and taking advantage of Emirates' chauffeur drive service at Heathrow, you can make use of the Emirates arrivals lounge which is just beside where chauffeur cars are parked outside Terminal 3, with hot tea and coffee, snacks, newspapers and magazines, satellite TV, a business area with computers, and free wifi. Emirates has now opened a new Business and First Class lounge at San Francisco international airport, and no longer will you have to use the JAL facilities. The lounge is a joint Business and First lounge, and takes all the elements of the standard Dubai lounge, including the large dining area and excellent bar. The lounge is big – really big: seating 130, and at 9500 square feet, it is much bigger than the recently opened Cathay Pacific lounge. The airline says it cost US$4 million to construct it at its US outpost, and it includes all the bling of its normal Dubai lounges, including Italian marble floors, gold Rolex clocks and rich timber joinery. Emirates frequent flyers will be very familiar with its yellow blue and beige colour scheme. The lounge has several features unique among the large lounge complex in San Francisco. It offers direct access to the boarding airbridge. It is also the only lounge with a dedicated prayer room. It is also split over two levels, with lifts and a staircase that connects the reception entrance on level three with the lounge below. 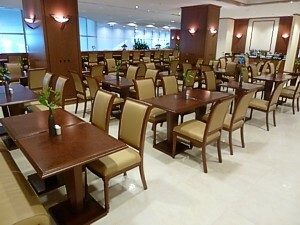 Once you get to the lounge it looks very familiar, with the standard Emirates Lounge concept. There are 56 beige leather armchairs around orate glass and mahogany coffee tables, with leafy dividers separating the different sections of the lounge. It has the feeling of a smart, but slightly tacky, hotel in Essex. That feeling isn’t helped by the two giant 60-inch LED TVs playing the sports channels: sometimes when there is a game on in the bay area, the volume is turned up high. The back half of the lounge is the dining area – and Emirates say it is the largest dining area within a lounge at San Francisco airport. This is entirely believable. 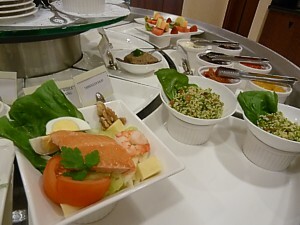 Thankfully food is very good, with all the usual Emirates salads, seafood and hot dishes. 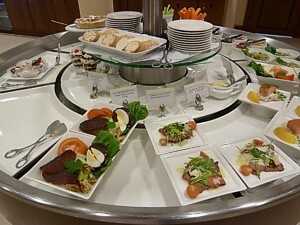 There is the usual round fridge, with plated salads, prawns, ham and cheese. Desserts are here too. Under the hot plates are quite a few hot alternatives, with curry and pasta on every day. The bar is good too, with a vast array of spirits, real French Sparkling Wine, and three other types of whites and three reds. There is a small business centre, free wifi, and also two showers. The Emirates lounge in Colombo is the Araliya Lounge for First, Business and Skywards Gold passengers, which is shared with other airlines like Thai, Qatar and Singapore. 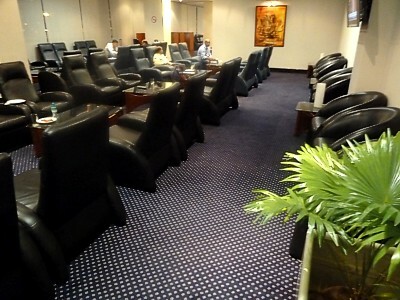 It is also the HSBC Premier Lounge in Colombo. 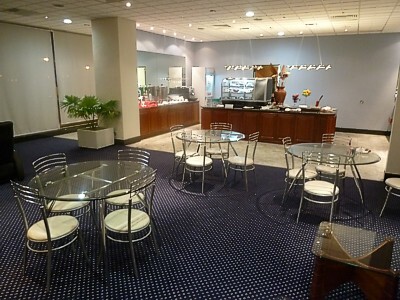 At times it can get very busy, however the Emirates Colombo Lounge keeps on changing. It was the Serendib lounge for a long time, but now finally it is the Araliya Lounge. To find the lounge once through security walk upstairs from the gates, and then as you walk in you think – isn't this dull. It has the atmosphere of an office reception, with dull blue carpet, and chairs that are straight out of a two star hotel lobby. The single (plastic) pot plant, and the glass topped coffee tables with (plastic) flowers add to the rather grim atmosphere. There are windows overlooking the apron, but with the aircon on full, there is a constant mist of condensation running down the glass. At least there is a decent telly, showing BBC World. There's quite a lot of food, although the presentation is as barren as the seating area, arranged along a dark wooden sideboard, in the hole at the far end of the lounge. The only redeeming feature is the hot food cabinet, which offers some decent mainly Sri Lankan curries, plus a few sandwiches. In the main chiller on the centre cabinet the sausage and pineapple salad has to be eaten to be believed. Try the desserts and you'll never live to regret it. To top this off, there are three main dining room tables, also glass toped, with the most uncomfortable metal chairs you'll ever find in a lounge. At right angles to this is the bar, which is pretty basic. There are two bottles of wine: one red, one white (in the bucket) which are typically Indian wine: Indian SavyB anyone? It is truly dreadful. 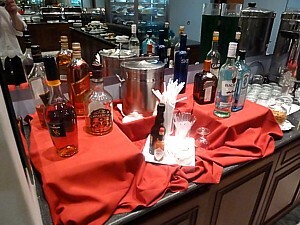 There are also eight spirits, arranged on a red table cloth, with cheap mainstream brands such as Red Label and Bacardi. 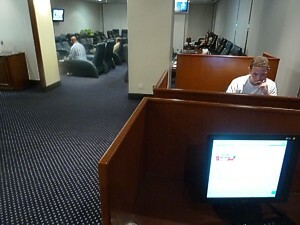 There are computers in the Araliya Colombo lounge, with 6 internet terminals in high wooden desks, which have large signs asking you to avoid drinking or eating at the desks, despite which people do, and other passengers let their children play on the computers for hours: getting hold of one to do some work can be a problem. Opposite the computers are newspaper racks with Sri Lankan newspapers and Emirates inflight magazines. There are toilets and showers in the lounge, however the showers don't have any shampoo or soap: indeed, getting hold of a towel can be a problem, because many people take a shower here before eating & getting on the late night planes. Seeing how hot and sweaty Colombo is, that isn't really surprising. Colombo is also the main jumping off point for many people before starting a cheap RTW ticket. This is easy to do, as you don't have to go landside on arrival in Colombo, but to allow for a misconnect, many passengers spend hours here after their arrival before the first flight of the RTW starts: as a result, there can be many people sleeping here before the 2am departure to Dubai: a favourite of the RTW crowd. 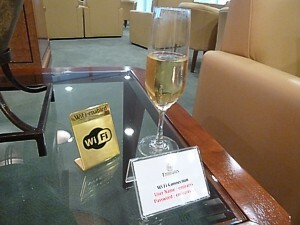 Emirates use the Finifenma lounge in Male, on the Maldives. Food is in a small square space with a couple of hot tourines, and a fridge. It isn't very good, but does feature a decent salad, and sometimes some OK hot dishes. There is also a basket of fruit. The bar is the bad bit about this lounge - No alcoholic drinks are available. On a high up worktop there are five computers and three further laptop workstations. Alas, these face with your back to the lounge, so they aren't very private. The lounge, on the whole, is pretty poor. If you have access to the HSBC Premier lounge, you might be better off using that.